At a lodge high in the Spanish Pyrenees, a stone’s throw from France, biologist Nick Barton and his field crew huddled around a small printout of a Google satellite map. The map showed a hybrid zone, a small patch of land just over a mile wide, where magenta snapdragon flowers meet yellow snapdragon flowers, and interbreed into an explosion of color—every combination of white, pink, and orange. It’s a natural experiment that’s been running for thousands of years, and Barton and his crew are here to collect the data. “Were there many flowers on Rainbow Road?” asked graduate student Lenka Matejovicova, referring to one of two roads that runs through the hybrid zone. Barton would know. He’s been here for nine consecutive summers, directing field crews in a long-term study of the hybrid zone. He’s British, but works in Austria at the Institute of Science and Technology as a theoretical biologist—which means that he’s interested in uncovering the broad rules that govern biology. Snapdragons are the perfect model organism, because they express their genetic characteristics so visually. That’s why they were studied by Gregor Mendel, the father of plant genetics. But snapdragons are not the only species with hybrid zones. In the past, Barton has studied grasshoppers, toads, and butterflies. To figure out why the color divide exists, Barton and his collaborators are attempting to do something that’s rare in nature: Create a hybrid family tree. 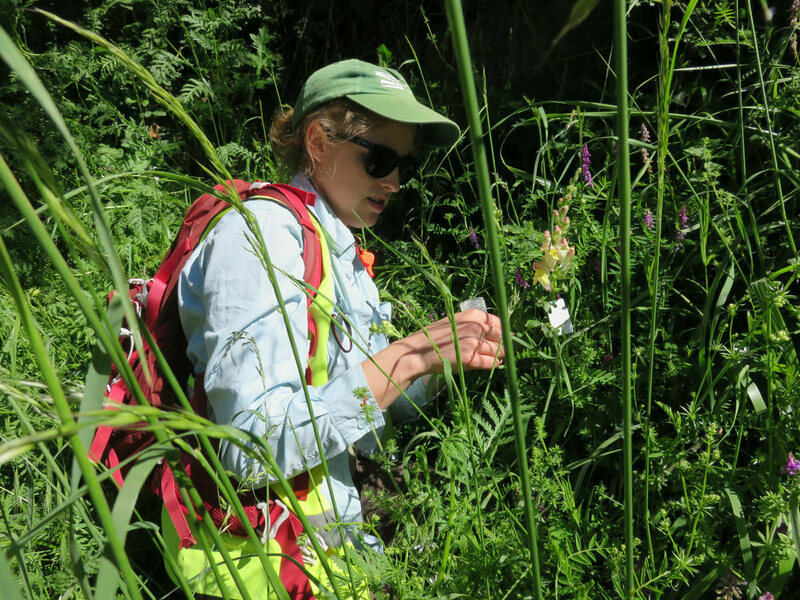 Their goal is to trace each individual flower back to its parents, grandparents, great-grandparents, and so on, for generations and generations, with data that would turn human genealogists green with envy. The family tree will help biologists understand why some traits are passed on while others die out, and ultimately, how plants become separate species. By mapping out the relationships of the wacky offspring between magenta and yellow snapdragons, scientists can tease out the mechanics and patterns of biology. They can make connections between the genes of individuals that have lots of offspring, and those that don’t. They can study the behavior of pollinators, and climate, and all kinds of variation in the environment, year after year. They can test their theories about how nature works, across hundreds of thousands of data points. Essentially, this stretch of roadside in the Pyrenees is the perfect natural laboratory. “Nature has done the crossing for you,” Barton says. There’s no need for long days spent breeding new specimens. “It makes it possible to do all sorts of things you couldn’t do artificially.” In other words, the snapdragons are running the experiment. But collecting the data is still a lot of human work. Once the morning’s route was decided, the all-female field crew of eight piled into a van and set off down a two-lane road. They donned reflective yellow vests and carried grocery bags loaded with labeled tags, plastic bottles for sampling, and satellite-connected surveying instruments called Trimbles. To the motorists, they looked like a highly specialized cleanup crew. But they were hunting for snapdragons. 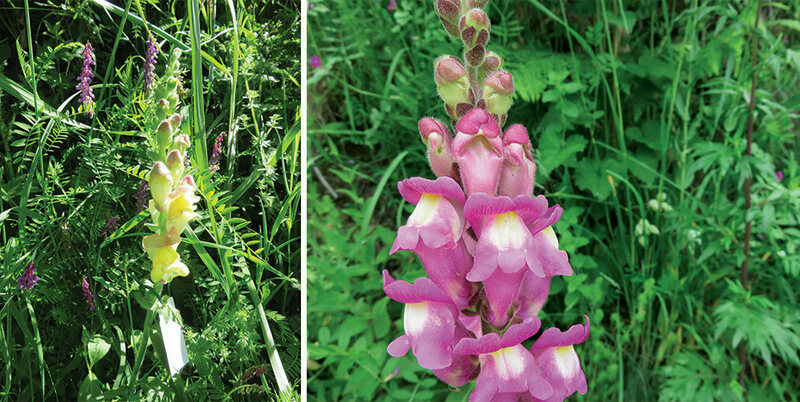 It was mid-June—peak snapdragon season. Usually the hybrid zone was ablaze with the snapdragon’s popcorn-shaped blooms at that time. But that day, it took a trained eye to spot them. It was Carina Baskett’s first day. She walked along the thin shoulder of the mountain road with grad student Louise Arathoon, scanning the green landscape. After a few minutes, they spotted a lone white snapdragon on the downward slope towards the river. They climbed over the guardrail and carefully made their way down to the plant. 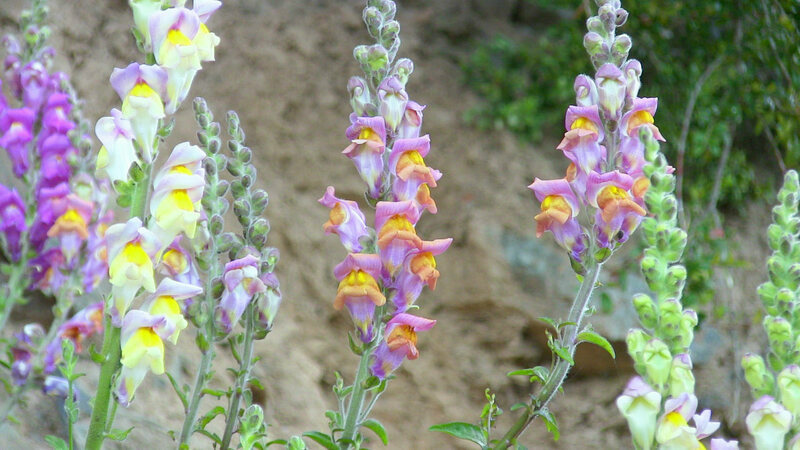 Upon close inspection, the snapdragon’s’ popcorn-sized flowers were marked by dainty yellow and pink accents. A true hybrid. Baskett held the bag of tags and bottles, while Louise readied the Trimble. “This will start searching for GPS coordinates,” Louise explained. Baskett read off the code on the tag and looped it around the base of the plant. This is what would create new pins on the satellite map, and forever tie the plant to its data. Then began the data collection process, including counting the number of flowers on each stem and measuring the flower’s height. 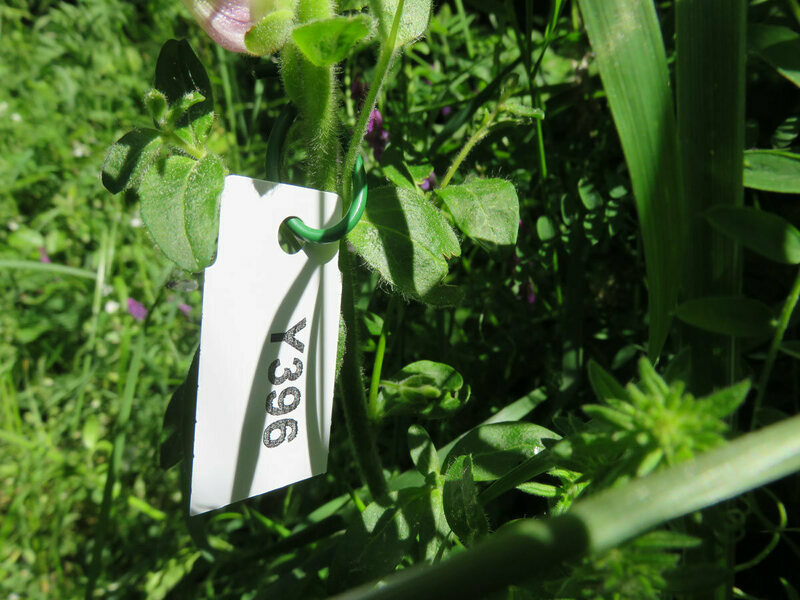 It wasn’t hard to understand why Barton refers to collection as “the ritual.” Baskett kept finding old tags around dead stems, a remnant of the flowers, and the scientists, who’d occupied the hybrid zone in previous years. The ritual has already yielded some high-profile discoveries in plant genetics. Enrico Coen of the John Innes Centre in Norwich, England, the biologist who first discovered the hybrid zone, published a paper in the journal Science last November explaining what maintains the sharp distinction between magenta and yellow snapdragons. He found that the gene that controls the yellow coloration uses a tool called small RNA to express itself, which the other subspecies doesn’t have. It pointed to how subspecies find different solutions to the same goal—becoming common enough to attract pollinators. It appears that the hybrids are not as successful, because they simply look strange to the bees they need to appeal to. By the time every snapdragon in that morning’s section of hybrid zone had been spotted, tagged, and sampled that morning, it was time for lunch. The van headed back up to the lodge with samples from 20 snapdragons. 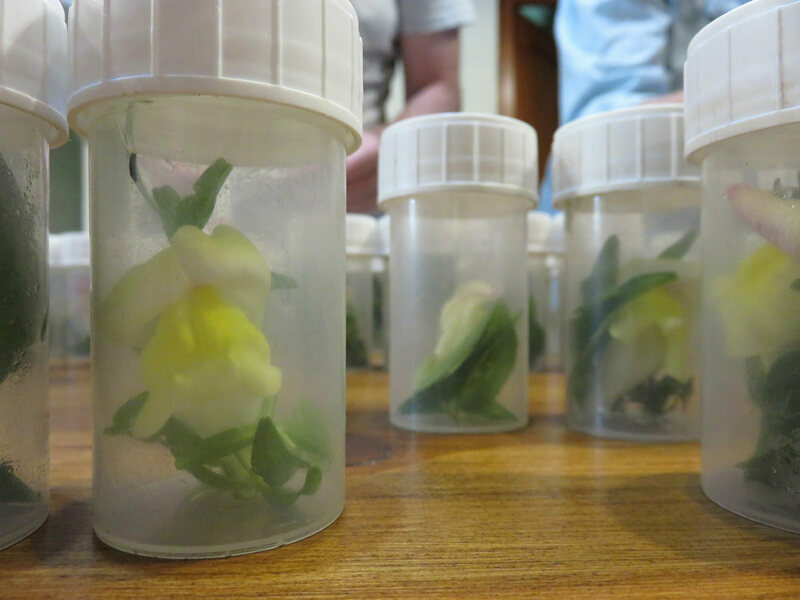 Over a typically Spanish spread of cheese, meat, and bread at an outdoor table overlooking the mountains, Barton told the story of a field crew member from a few years back, who showed up to work without knowing what a snapdragon looked like. He had thought he would be searching for lizards. “Did he stay the whole season?” someone asked. “He did,” Barton answered proudly. The work of tagging and measuring may get mundane, even boring, and last for years. But when the snapdragon hybrid family tree is complete, it will mean that some of the most interesting questions about biology, evolution, and nature can be answered. Not a bad way to spend a summer, when you think about it.